Wow, this book was dissonant. Jeb Kinnison hands his protagonists the ring of power on a silver platter (Steve Duong’s de facto omnipotence through “root access” to the world), and, unfortunately, these originally Libertarian minded protagonists end up becoming almost as totalitarian as their opponents. Nevermind what these people talk about amongst themselves philosophically, nevermind their misgivings about how they end up using this unanswerable power: Look at what they do with it! Rather than spreading this knowledge and power to others, they hoard and restrict it. Rather than letting seven billion minds figure out what to do with this power, they set themselves up as Olympian gods, and play political power games with the current nations of Earth. They hold back the truth about their abilities in an attempt to control how people can use their technology, not trusting anyone but themselves with control. They even try to manipulate the uses people will put their nerfed ‘replicators’ to by playing games with what they will allow it to produce. Eventually they begin making vast sweeping decisions in the name of all of ‘civilization’, like exiling people to other planets where presumably they will be prevented from ever trying to reproduce the technology that put them there. (Not killing someone in self defense, not keeping someone away from them personally, but deciding for every human extant to imprison these personal enemies of theirs – cutting them off from everyone’s association in a stunning violation of the will of others). In the end, these protagonists control a surveillance and force apparatus infinitely more detailed and invasive than anything the authoritarian Earth governments could produce. Maybe part of this was authorial intent. If so, this book can be read as a chilling cautionary tale. If not, it is an awe inspiring exercise in “it’s okay if our guys do it!” On one level, there are the words the characters say, the libertarian philosophy they ostensibly believe, and on the other level, there are the things they do in exercising omnipotent control over the people of Earth. It is normally a bad idea to respond to reviews, but it’s notable that the two less-than-stellar reviews are from people disappointed because they feel the books aren’t ideologically pure enough, especially another review from an Ayn Rand admirer who trashed Red Queen for dissenting from orthodoxy. So here’s a response. “…while the Constitution protects against invasions of individual rights, it is not a suicide pact.” This is from a court ruling discussing the conflict of basic rights and pragmatic needs under unusual circumstances like war which threaten survival. The review above very perceptively notes that our rebels act in what amounts to wartime to limit information and technology for reasons of survival and to prevent what they see as likely catastrophe if they release their technology too quickly or without restrictions. As a thought experiment, suppose I develop a multi-kilotonne, nuclear-equivalent bomb which can be easily built out of items purchased at a hardware store and fit into a coffee can. Am I violating others’ rights by keeping that technology to myself? The consequences of release are obviously deadly for millions and perhaps the entire species. Similarly, the rebels reasonably foresee economic disaster and dislocation starving millions if instant transport and replication are uncautiously introduced into the world as it is. As the reviewer says, the rebels talk a good libertarian game but aren’t foolish enough to endanger themselves or innocents by acting according to simplistic principles when the consequences are so dire. The point of their many discussions is how to reach what they envision as the desirable end state of freedom and universal prosperity from their current world of shortages and political controls. They are dealing with the world and the population and governments it has, not those they might wish it had, and trying to steer a dangerous course between acting for their own survival only and acting to better all of humankind, in the long run. Because they have powerful and immoral enemies, they must keep control of their technology themselves, until such time as the power of their enemies ebbs away; because they want to share the benefits with everyone, they release less dangerous and more beneficial limited versions as circumstances allow. And they try their best to limit harms to others while they remove threats to themselves. Our reviewer is noticing the conflict that motivates the next few books in the series — the power they have rationally reserved to the only people they can currently trust, themselves, corrupts. Some choose to keep it for themselves when the reason for such controls has passed. Those who enjoy a privileged position are tempted to rationalize as needed to justify holding onto it. This question is reflected in our current world of surveillance and the soon-to-be one of nanobots, drones, and global data collection: what does it mean to freedom when every public event is observed and recorded? Is it possible to limit access to “necessary” uses? What if it isn’t, and we realize the only way to limit the power of large organizations like governments to do harm is to open access to everyone so that governments and private organizations can themselves be watched? The series could be viewed as a thought experiment: what would happen if you gave freedom-oriented, libertarian-ish people the ability to change the world? The specific instance of the American occupation of Iraq is mentioned as a cautionary tale: in toppling existing repressive power structures, the occupiers freed all the repressed tribal groups to use violence and terror to contend for power and graft. The global version of that would be horrific. The US founders knew their proposed system was only workable with an enlightened and independent population, and only fools would try to overthrow an existing repressive system without providing enforcement tools to assure that bullies and warlords would not immediately take over. 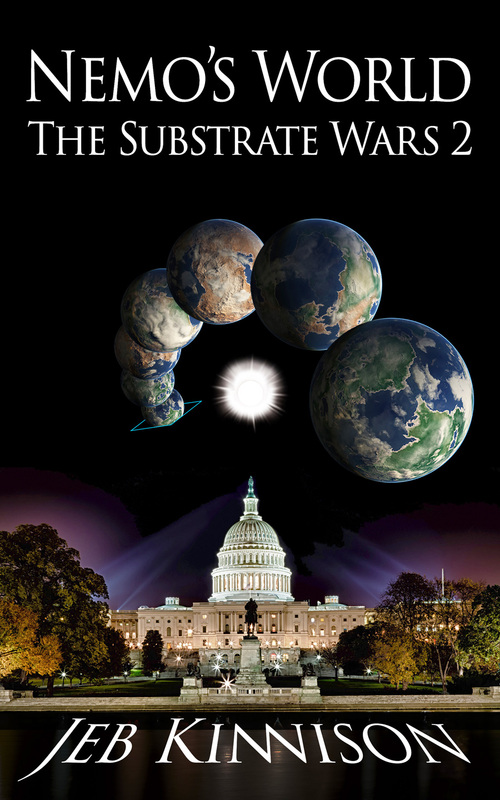 Posted in Books, Government, Science Fiction and tagged nemo's world, nemo's-world-the-substrate-wars, personal freedoms, quantum gateways, quantum transport, red queen: the substrate wars, review, substrate wars on April 14, 2015 by Jeb Kinnison.